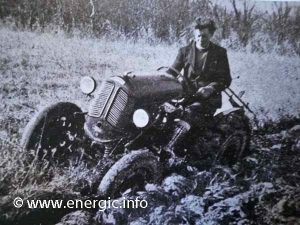 Early Energic tracteur 509 prototype trials, driven by Mr A Patissier (photo courtesy of Karl Puhl). When the very early prototypes of the new 500 ( to be series 511) tractors where at the drawing board stages. 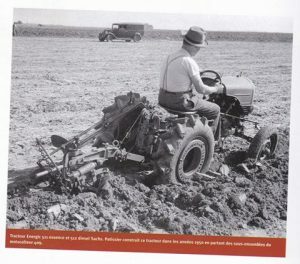 The 409 9cv motoculteur engine was fitted to a 500 chassis and it was found to be significantly under powered for the weight of the tractor. Ets Patissier ran trials with various engine sizes. So this project 509, 9cv tractor (moteur used in the 409 motoculteur) was shelved in favor of the larger 11cv petrol Patissier engine fitted to the 511, 1949/50. Production models appearing in 1950, and version 2 in 1955. Engine. Single cylinder Patissier engine, 9cv, 500cm3, air cooled, four stroke with enclosed Lateral valves (soupapes latérales). Air filter/Cleaner. Metallic element – (dependent upon the element that can be oil surface coated).. Gears. The three speed gear box is built within the engine offering 2 variations either 3 forward and 1 reverse or 6 forward and 3 reverse gears.12 gears where obtainable as a optional extra. Differential lockable. Clutch. Multiple disc type immersed in oil, within the chassis casing. PTO; front (revolving at the speed of the engine), side and rear (turning between 125 and 1800 rp/m). Clutch engagement for the PTO systems. ( PTO rear and side options). Embrayage est du type à disques multiples baignat dans l’huile. Wheels. 3 options; Pneumatic Tyre wheels front 400 x 15 and 750 x 18 Rear. Blockage independent for each wheel. Wheel width is regular-able between in 9 stages between 0.53m and 1.15m. These widths are obtained by altering the wheels into different positions. Fuel consumption. 1 1/4 to 2 liters of fuel per hour dependent upon working conditions. the tank holds approx.17 liters. (Réservoir de carburant). Diamentions. Length 2.2m, width .85m and hieght to steering wheel 1.15m. (Longueur totale 2 200 mm, Largeur de 850, à 1 150 mm Hauteur au volant).